Pantone's just-announced colour of the year is a predictor of what will be big in 2017, but some designs in the hue are already here. The colour company's pick for next year is a "tangy yellow-green" shade called Greenery – technically, Pantone 15-0343. If 2016 colour of the year rose-quartz is any indication, then we can expect to see a very green 2017. Variations of the shade have already cropped up in the likes of 3D-knitted chairs by Benjamin Hubert, rocking horses by Thonet and uranium glassware by Martin Jakobsen. 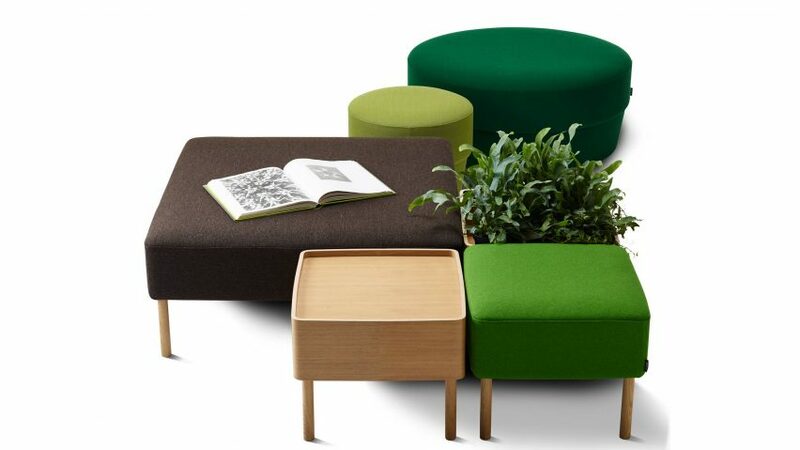 The Konnekt system by Gothenburg designer Roger Persson comprises poufs in several shades of green, including one similar to Pantone 15-0343. The variously shaped modules can be mixed and matched together with backrests, tables and planters to create an island of seating. Benjamin Hubert's Cradle chair collection features seat backs made from a stretch mesh created using similar knitting technology to Nike's Flyknit material. In one of the colour combinations, a teal seat joins a Greenery-like mesh textile backrest, which imitates the feel of leaning back in a hammock. The Roll chair's back support is formed from padded horizontal strips that look as if they've been wrapped up and attached like roll mats tied to a backpack. Spanish designer Patricia Urquiola created the chair for outdoor use, so it's fitting it comes in a grassy Greenery-like shade. Danish lighting manufacturer Louis Poulsen is now producing a mini version of the iconic Panthella lamp by Verner Panton. The desktop lamps come in a range of bright colours drawn from Panton's work, including this glossy green, straight out of the 1970s. Stockholm studio Front based its minimal rocking horse for Gebrüder Thonet Vienna on a bent-wood chair from the furniture brand's archive. Designed for children's rooms, the Furia rocking horse comes with an upholstered leather seat in a range of colours, including this slightly muted relative of Greenery. Tumblers in the Gem collection are made from hand-blown uranium glass, which Czech designer Martin Jakobsen had to acquire special permission from the State Office for Nuclear Safety in his home country to produce. The uranium in the glasses fluoresces under ultraviolet light, producing a bright green glow. Brazilian duo Humberto and Fernando Campana used coloured glass to fill blob-shaped gaps in this wooden cabinet, creating an impression similar to a fish tank. The buffet is built from ash or pine wood, with bright green glass allowing views through the furniture. Design studio Faudet-Harrison – based in both London and Amsterdam – took references from 1920s furniture for its Continuous sofa system, available as three-seater and L-shapes configurations as well as a bench. This version is upholstered in a lime green Kvadrat Tonus wool-blend fabric.